NEW ORLEANS – After a week’s absence the Grand Canyon women are back at the top of the U.S. Track & Field and Cross Country Coaches Association (USTFCCCA) Division II National Team Computer Rankings, while the men’s race is becoming more congested. A strong weekend performance at the PacWest Championships earned the Grand Canyon women a team trophy and the No. 1 spot in the rankings after falling to No. 2 last week. Meanwhile, their male teammates used the PacWest Championships to pull themselves into the race for the top few spots after both No. 1 Saint Augustine’s and No. 2 Adams State slipped. 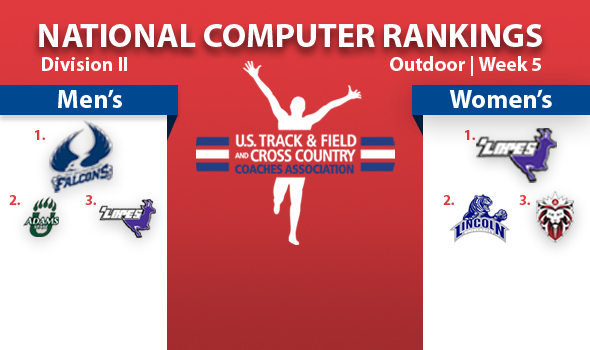 The National Team Computer Rankings are a projection of how teams could fare at the NCAA Outdoor Championships. This is the first week that does not feature marks from 2012, except for combined events. An explanation of the rankings system can be found here. The Antelopes had an exceptional weekend in claiming the PacWest Outdoor team championship title, recording 12 performances that improved upon their season’s bests entering the weekend, and as a result gained a top-25-best 29.16 net points for a team score of 244.84. Driving the Antelopes’ surge to the top was 200 meter runners Shavine Hodge (No. 3, 23.51) and Petra Fanty (No. 6, 23.61), as well as triple jumper Jessica Yates (No. 6, 41-1/12.52m). As Grand Canyon surged to reclaim No. 1, Lincoln (Mo.) slipped to No. 2 with a 5.83 net loss to 224.13. Indoor champion Academy of Art made small gains at No. 3, inching up 3.52 net points to 213.78 and drawing ever nearer the top two positions — potentially positioning itself for a late-season run to the top as was the case in the indoor season. Defending outdoor champion Grand Valley State remained stationary and in the hunt at No. 4 despite a 6.13 net loss to 202.44. Adams State rounded out the top five at 150.80 after a 12.79 net loss. Though each the top five teams remained stationary in terms of rank, No. 1 Saint Augustine’s and No. 2 Adams State came back to the pack while No. 3 Grand Canyon and No. 4 Ashland both made significant gains on the team score front. Indoor champ Saint Augustine’s suffered the biggest team points drop-off of any top-25 team, sliding 20.92 net points for a 254.28, while defending outdoor champion Adams State checked in at 246.42 after a 14.04 point net loss. Following a PacWest Championship, Grand Canyon jumped up 15.08 net points to 213.93. National Athlete of the Week Fred Taylor had a lot to do with the increase, moving to No. 1 at 200 meters (20.75) and No. 2 at 100 (10.23), while triple jumper Kevin Lashley leapt 10 spots to No. 5 (50-4½/15.35m). It was Ashland, however, that recorded the biggest gains this weekend, improving 21.4 net points — most of any top-25 team — to 197.12. The squad recorded five new top-10 performances and 11 total season’s best marks at its home meet this past weekend. Findlay rounded out the top five at 130.11 following a 7.1 net loss.